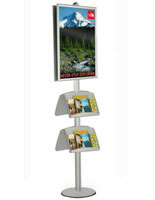 Snap Frames : A sign stand from SnapFrames.com will grab the attention of passersby! 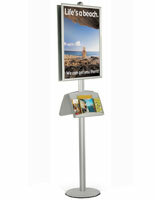 This sign stand holds one snap open poster frame and two steel literature trays. 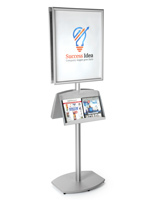 The sign stand, sign display, draws customer attention to your posters and entices them to take away brochures or literature. 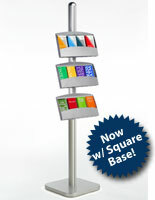 This sign stand is a large and effective sign stand for open indoor areas. Place this sign stand in exhibition halls, convention centers, lobbies, large retail outlets or universities now! 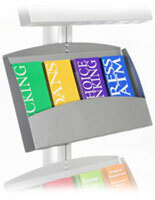 The snap open frame on the sign stand makes graphic loading easy. Simply snap open all four edges of the frames and insert the clear plastic lens. Then simply close all four frame edges - done! The two metal literature trays are made of powder coated steel. 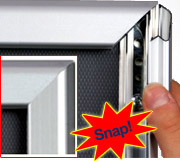 Installation or height adjustment of the snap open holder and literature trays is easily performed with the connector plate screws on the back of the frame and tray accessories. Note: When the poster frame and metal trays are at their highest adjustment, the height of the bottom of the lower metal tray is 24" above the floor.